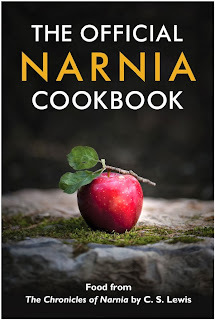 Originally published in physical form in the late 90s and out of print shortly thereafter, The Official Narnia Cookbook: Food from The Chronicles of Narnia by C.S. Lewis is back in action (11/5/13) in eBook form as part of the celebration remembering C. S. Lewis, 50 years after his passing. With recipes selected and introduced by Lewis' stepson, Douglas Gresham, along with the original illustrations from the books, in color, by Pauline Baynes, this book is a delicious companion to The Chronicles of Narnia. 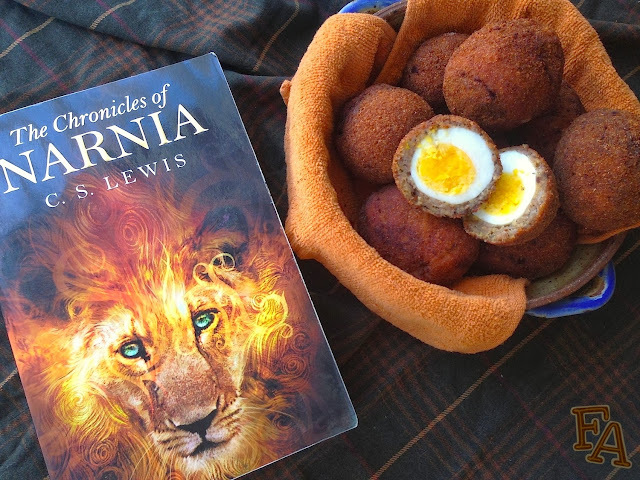 Whereas not exhaustive, the cookbook contains recipes for foods mentioned specifically in the series, others inspired by the setting and culture of Narnia, and many favorites of Lewis that surely he had in mind when he was writing. Remember C. S. Lewis, 50 years later, with a celebration of food from one of the most cherished fantasy series in the world! 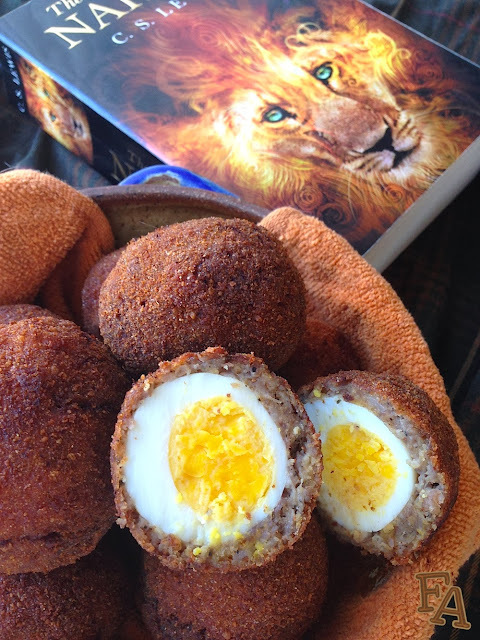 Included in the Narnia Cookbook is a recipe for Scotch eggs, hardboiled eggs wrapped in ground sausage, a common food in the UK often packed for picnics. Gresham mentions these eggs in relation to Narnian dwarves. The recipe below is not copied from the cookbook but is in my own words from my own experience. Also, just FYI, Scotch eggs are brilliant for wee ones. Smalls loves these 'cause they're yummy and easy to handle. And it's protein, baby! 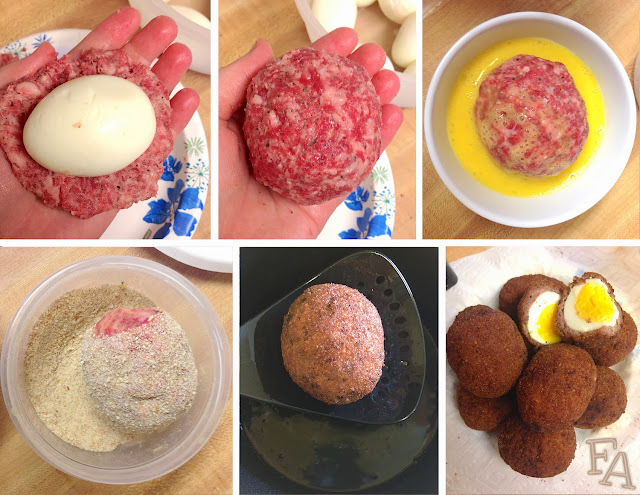 "Scotch eggs are absolutely delicious and filled with proteins and vitamins. 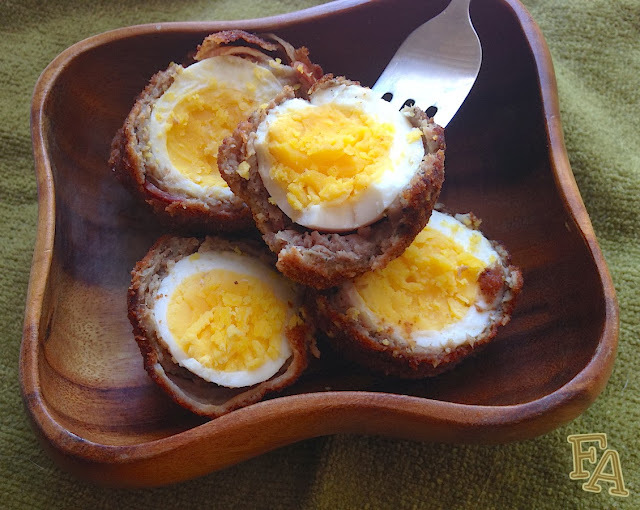 Cold Scotch eggs are also used by Dwarfs and others as easily carried traveling food." A favorite traveling food of Dwarves, like Trumpkin whom we meet in Prince Caspian. 1. Heat oil in your deep fryer (or pot or 1/2" oil in a pan, be careful that it doesn't get to smoking). Set out your hardboiled eggs, ground sausage, beaten egg, and bread crumbs in an assembly line (in that order). Pat the hardboiled eggs off with a paper towel. Take a small ball of sausage & flatten it out in your palm. Place an egg on top & smooth the meat up & around the egg until it is completely covered in a thin layer. Dip the sausage wrapped egg in the beaten egg, making sure it's completely covered & then roll it the bread crumbs, again, until covered completely. Option: Wrap a strip of bacon around the sausage covered egg before dipping it in the beaten egg & bread crumbs. You'll need to cook each egg about a minute longer if you go this route. 2. Lower 1-2 wrapped eggs at a time into the deep fryer & cook for 2 to 2 1/2 minutes (if cooking in a pan, cook about 2 mins each side & cut open a little bit to make sure the meat is no longer pink. Seriously a little deep fryer is much easier!). Place cooked Scotch eggs on paper towels to drain & serve warm! Or wrap them up & stow them in your pouch if you're going questing. Totally fine eaten cold. Serving Suggestion: Dip in your favorite sauce like ranch or ketchup. Also, wonderful flavor compliment when eaten with orange slices (throw an orange into your travel pouch, easy peasy! ).